Mary Jane Malandrucco saw the ocean view; her husband, Greg, saw a great deal of work. Ask Sam Malandrucco, 3, what he likes to do at the Shore, and he shrugs. "I dunno," he says and goes back to pushing a toy bus full of animals across the hardwood floor of his family's North Wildwood condo. Mary Jane Malandrucco insists that is not so, and as his mother talks about playing in the ocean, digging in the sand, and riding bikes, Sam gives a wide smile, then tumbles playfully across the floor. Sam was still a baby in 2007 when Malandrucco came back from a girls' weekend at the Shore that included making a bid on a condo - without telling her husband, Greg. "Instead of trying to talk him into things, it works better if he tries to talk me out of it," said Mary Jane Malandrucco, 47, a sales rep for Element K, an e-learning company. Greg Malandrucco could have made a good case against buying this condo. The two-bedroom, two-bath unit, built in the early 1980s, was in poor shape. "I was apprehensive, to say the least," said Greg Malandrucco, 49, an IT manager for the Tredyffrin/Easttown School District in Chester County. "All I could see was work, and all Mary Jane could see was the beach." Ocean views helped sell him on the place. So did the garage, which he would use for staging his renovation work - taking out and replacing everything except the smoke detector and the carbon monoxide alarm on the way to creating a cozy vacation home. The couple, whose primary home is in West Chester, bonded over a renovation project when they met 22 years ago. Mary Jane Malandrucco tried to repaint the kitchen of her Mays Landing condo soon after she met her future husband. It did not exactly turn out as planned, so Greg Malandrucco offered to redo it. "That bad paint job led to a new kitchen," she said. Together, the couple, who married in 2000, have bought, fixed up, and eventually sold homes in Chesterbrook and Sicklerville. Greg Malandrucco, who learned about repairs while working at his father's deli, did most of the home improvements himself, building on those skills (and buying tools, he says) with every project. Both liked the Shore. Mary Jane Malandrucco, who grew up in Pottstown, worked in Stone Harbor during summers as a college student; Greg Malandrucco, who grew up in West Philadelphia and Havertown, spent two weeks in Wildwood with his family every year. "I always thought that I'd eventually buy something at the Shore," Mary Jane Malandrucco said. So she kept her eyes open. Still, she acknowledged, when she saw the listing for the North Wildwood condo in the newspaper, "the pictures were so awful." The condo had not been updated since the building was constructed in the 1980s. It still had wood paneling, shag carpet, and dated wallpaper in the kitchen. "But the ocean view kept me looking," Mary Jane Malandrucco said - you can see the sea from the living room, kitchen, and bedrooms. She toured the place on that weekend away with her friends and put in the offer. The couple bought the place and, swayed by Mary Jane Malandrucco's vision, Greg Malandrucco went to work, taking on projects at the condo between the freelance jobs he was doing then. He started in the kitchen, taking everything down to the studs. He kept the basic floor plan, but changed the cabinet layout a bit and substituted an island for the wrought-iron railing that separated the kitchen from the sunken living room. They put seating on both sides - regular chairs in the kitchen, bar stools in the living room - so the island could be used for dining, which freed up space. Then Greg Malandrucco ripped up all the rugs - no small feat considering that the previous owner carpeted just about everything, including the bathrooms and on top of the half-inch molding in every room of the house. The Malandruccos replaced the floors with hardwood, except for tile in the kitchen and bathrooms. They added white wainscoting to the bathrooms, too, and a walk-in shower to the master bath. A fireplace in the living room was covered with faux-brick wallpaper. Greg Malandrucco redid the tile, hearth, and mantel. Out went floral wallpaper and wood paneling. In came drywall, so the walls could be repainted in cool, beachy blues and greens. Greg Malandrucco also added white trim and molding throughout the house and wired the ceilings for surround-sound speakers and a fan in the living room. The laundry area was reconfigured for a full-size stacked washer and dryer. Sam's bedroom has special bunk beds - a twin on top and a full-size bed on the bottom - for guests and sleepovers. "This is my big-boy bed," he said, proudly jumping on the bottom bunk. His playpen now holds his toys. Mary Jane Malandrucco confesses that her husband is the one with the handyman skills. She just picks out the properties and envisions what a space could be. 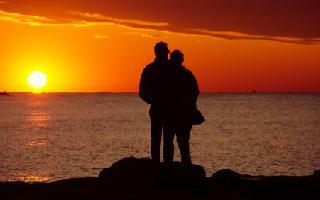 "Greg and I have always been able to see . . . potential," she said. There were complications, naturally, like the water damage they found around the living room's sliding glass door. The refrigerator caught fire, so they lived out of a cooler until a new one arrived, sooner than expected. Not that their son minded. "Sam liked playing in the refrigerator box," Mary Jane Malandrucco said. Want more proof the Hamptons may be passe? While Long Island summer share and house rentals continue to drop in cost, rental prices on the Jersey Shore this year haven’t decreased. But that doesn’t mean the Jersey coastline is immune from the economic crisis, or that good deals can’t be found. Holder’s agency, which serves Monmouth and Ocean counties, has experienced a decline of Wall Street tenants and a lower inventory since homeowners are utilizing their own summer properties. Not surprisingly, some homeowners are attempting to sell their second homes. Despite the times, the summer rental market along the Jersey Shore remains active since each town caters to different lifestyles. If you’re looking for a deal this summer, try these towns. Free beaches and amusement parks keep Wildwood popular among the MTV generation. Spanning two miles and 38 blocks, the town’s old-fashioned boardwalk features a wide range of arcade and carnival-style games, water parks, world-class roller coasters, souvenir shops and eateries. Although this town is very family-oriented, it also boasts a great nightlife for singles and couples with trendy nightclubs like the Stardust Club and Echo’s and Irish pubs like the Shamrock Cafe and Westy’s Irish Pub. 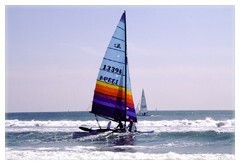 There is a large selection of rental properties which can be viewed at www.WildwoodRents.com . Local Cops Hit the Jackpot! They didn’t become mega-millionaires. But at the Wildwood Crest Police Department, nobody is complaining about the quarter-million dollars that suddenly rolled in. “Took me a few good hours to believe what was being told to me,” said Detective Ed Gorski, one of 14 members of the force who each threw in $5 for tickets in the February 27 Mega Millions drawing. The jackpot that night was worth $171 million. The group had all the winning numbers except the Mega Ball, which delivered them a $250,000 prize. That equals about $13,000 each, after taxes. “I was surprised. I certainly never thought I would be part of any winnings of the lottery,” Patrolman Robert Lloyd told NBC10 News Friday. One of the department’s sergeants bought the ticket at the Crest Tavern in nearby Lower Township, but nobody realized it was worth so much until weeks later, when the bar put up a sign advertising that it had sold a winning ticket. “(The sergeant) told us on April 1st so I thought it was an April fools joke, but it turned out it was true,” Lloyd recalled. So what are they going to do with the cash? “Pay off some bills, put some away. I’m getting married next month, so that’ll help out,” Lloyd said. AVALON — Cape May County freeholders on Tuesday night rejected a $61,000 bid by the Windward Harbor Condominium Association to purchase county property for additional parking. The county's asking price was $1.1 million. There were no other bidders at the Oct. 27 auction because the land — located on the county right of way off Ocean Drive and capable of adding 17 parking spots — cannot be built on. Windward Harbor on Ocean Drive and Seventh Street burned down in a December 2003 fire. The 45-unit complex has since been rebuilt. However, when the Avalon Zoning/Planning Board approved its plans in 2005, it asked the association to look for more parking spaces. The association was not required to find them. County Administrator Stephen O'Connor said the county's appraiser Metro of Marmora appraised the 4,535–square-foot land at $1.1 million. Its value included the additional units that could be created by the additional parking, he said. Because zoning requirements changed since it was built in 1970, Windward Harbor required more parking spots when it was rebuilt 35 years later. Board Chairman Neil Hensel said the county's appraisal number seemed especially high for an unbuildable piece of property, and he would not expect the condominium to purchase that property at that price. The condominium complex, located on a 71,900 square-foot parcel of land, sits off the bay in Avalon's northern end. The condo association had previously and unsuccessfully sought room for additional parking from nearby property owners. “Even with county land, Windward Harbor will rely on ... on-street parking,” according to the Planning/Zoning Board's approval, dated February of 2005. The condominium association is represented by attorney Michael Fusco. A woman answering the phone at his Ocean City office Wednesday said Fusco does not speak to reporters. Anthony Taormina, president of Windward Harbor's board of directors, could not be reached Wednesday. On Dec. 3, 2003, a fast-moving fire struck Windward Harbor. It took 125 firefighters from 10 fire companies almost five hours to contain the blaze. The fire was so hot it melted parts of nearby fire trucks and houses. There were no injuries, but the fire destroyed seven of eight buildings that comprise the complex. The eighth building was demolished in May 2005 to make room for the new construction. “This is one of those disasters that happens to a town once in a lifetime,” Hensel said. AVALON, N.J. - A group of property owners trying to preserve a coastal anomaly known as the Avalon High Dunes has sued a Pennsylvania potato chip magnate, the borough and New Jersey's Department of Environmental Protection in its latest effort to halt construction of the chip king's 14,000-square-foot beach mansion. At the same time, Utz Quality Foods president Michael Rice has sued Avalon for denying his application to add one more luxurious amenity to his Dune Drive property - a large swimming pool. The lawsuits are the latest salvos in a saga that has pitted hundreds of local and summer residents against Rice, and his wife, Jane. Jane Rice is marketing vice president of the Hanover, Pa., snack-maker. Placard-toting demonstrators, printed flyers and outbursts at municipal meetings denouncing the mansion have punctuated life in the tony beach town for months. The mansion is being built on more than an acre of the Avalon High Dunes - a two-mile stretch of mostly undeveloped sandy grasslands and maritime forests that is one of the few such natural areas left on the East Coast. The Rices already own one of the largest beach houses in Avalon, a 7,000-square-foot home assessed at $8.75 million, located a few blocks from the new mansion. Rice's attorney, Richard Hluchan of Voorhees, said this week that the Rices would use the opulent new mansion as a summer residence. Construction began last spring. "People can oppose whatever they want and say whatever they want about the property, but Mr. Rice has lawful approvals and permits from the DEP and from the borough to continue the construction of his home," Hluchan said. "And he will." Hluchan said Rice's lawsuit is based on approval the snack king received in 2001 from the DEP to replace a 1,429-square-foot dwelling on the property with a single-family home, swimming pool and cabana. When completed, Rice's mansion will be six times the size of the average U.S. home and will include 40 rooms, 15 bathrooms, and maids' quarters. The mansion under construction is a scaled-down version of the 20,000-square-foot home the couple originally wanted to build on the 1.2-acre dune-top property they purchased in 2000 for $3.5 million. In 2001, the couple reached a legal settlement with the DEP allowing them to build a 14,000-square-foot home on the site. The mega-size mansion has sparked a trend in Avalon, where the median price of a home is more than $1 million. In the last several months, the borough has fielded applications and queries about construction of other huge homes and restaurants in the dunes and in other areas of the barrier island community. 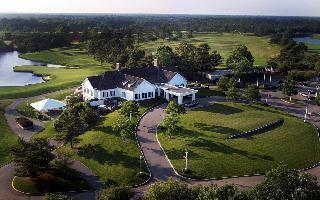 That has prompted a group of more than 150 property owners called Save Avalon Dunes to kick into high gear. This summer, members of the group held several demonstrations outside the Rice mansion construction site. The group also tried unsuccessfully to get the borough and the DEP to impose stronger regulations against development in the high dunes area. But by the end of the summer, SAD founder Elaine Scattergood said the group, now incorporated as a nonprofit, felt it needed to take legal action. "We don't want to look like Wildwood, and the borough is basically doing nothing to prevent this," Scattergood said. "It's not just this one issue or this one house, it's a pattern of development that could forever change the way Avalon is and has been for a very long time." The lawsuit seeks to invalidate the April 2001 agreement between Rice and the DEP that allows the construction of the mansion. The suit alleges that the state failed to properly notify Avalon and the public about the agreement as "required by governing regulation" and that the permit was granted without "rational determination that the proposed construction will result in 'minimal practicable degradation' of the High Dunes." The lawsuit also says the Rice property is subject to the terms of a 1994 state aid agreement between the DEP and Avalon that prohibits the construction of swimming pools, tennis courts and similar structures in the dunes. The agreement was a contingency to Avalon receiving millions in state and federal aid for a beach replenishment project. Superior Court Judge Steven Perskie this week denied a request by the residents' group to immediately halt construction until the lawsuits are litigated. Avalon Borough solicitor Stephen Barse declined comment on either lawsuit, as did the DEP. STONE HARBOR — Borough Council passed a law Tuesday that will allow BYOB restaurants to start selling Garden State wines later this summer. Better known for its blueberries and tomatoes, New Jersey allows local wineries to sell their product at many eateries to promote the winegrowing industry. Borough Council allowed the sales by enlarging its existing alcohol zone, which excludes most restaurants, to include sales of New Jersey wines. Deanna Ebner, who owns Sea Salt on 83rd Street with her husband, said the ordinance will allow her business to offer another option to patrons. They already incorporate locally grown fruits and vegetables in their menus, so the local vino made sense, she said. Ebner doesn't know how much it will affect her business, where people can bring their own wines from far more diverse regions around the world. Several other restaurateurs spoke in support of the decision. But Stone Harbor's wine decision didn't go down very smoothly. It left a bitter taste in the mouths of some.Martha Conlin, who lives on 84th Street, said there was no reason to introduce more alcohol sales in the area, particularly those near residences. Borough Solicitor Michael Donohue said Stone Harbor has been approached about a half dozen times in the past four years by restaurants seeking to sell New Jersey-produced wines with dinner. But those establishments were outside the downtown alcohol zone, which centers around 96th Street and 2nd and 3rd avenues, and requests were denied. Recently, the borough sent the issue to the Planning Board, which in June week voted to recommend such sales anywhere in the business districts, which run for several blocks along 2nd and 3rd avenues and in two satellite districts at 83rd and 107th streets. The law only allows the sale of New Jersey wines and only at restaurants. Borough Council voted 5-1 on the ordinance. Councilman Karl Giulian dissented, stating that wine is alcohol, no matter how you look at it, and the ordinance is bringing alcohol to the neighborhoods. He also feared that the state would expand its New Jersey winery program to include local breweries or more intoxicating liquors. New Jersey — no Napa Valley, Calif., by any stretch — has more than two dozen wineries, including several in Cape May County. According to the Garden State Winegrowers Association, the state produces more than 1 million gallons a year. As beach mansions rise, there are fears about this unique coastline. A house going up now has 40 rooms. Some ask: "How big is big enough?" AVALON, N.J. - The high dunes of Avalon, a mostly undeveloped stretch of sandy grassland and woods thick with bayberry, Atlantic white cedar, and pines that soar 50 feet above the beachfront, are unique along the southern New Jersey shore. Mostly by luck, Avalon's high dunes have survived the development that has all but erased similar strands that once lined the entire 127-mile coastline. The high dunes of Avalon are under attack. It turns out that the same characteristics that environmentalists and local officials want to protect - beauty, uniqueness, and a buffer for the coastline - have attracted investors to this upscale Cape May County municipality who want to build dune beach mansions. A Pennsylvania potato-chip magnate is building a 14,000-square-foot beach house - six times bigger than the average U.S. home - on Avalon's high dunes. Another landowner has applied to the borough zoning office to build a 4,200-square-foot house two blocks away. Plans for a 10,000-square-foot house in another area of the dunes were recently withdrawn, but may be resubmitted later, officials said. "We have an incredible national treasure here in our high dunes, and there doesn't seem to be any mechanism in place to make sure they remain," said Elaine Scattergood, who can still remember when many of the paved streets on the island were dirt roads. "We've seen big houses here for a long time, but they are getting bigger and bigger, really to the detriment of everything else around them," said Michael Collins, whose roots in the town date to the 1940s, when his father was a beach patrol captain here. "The question becomes, 'How big is big enough?' Do people really need summer houses that are this big and use up this much of a natural resource?" Scattergood and Collins are among those who have organized a 100-member group of locals and summer residents called Save Avalon Dunes. The group, Scattergood said, asks local officials: "How did this happen?" Why, wondered Scattergood, did regulations protecting the dunes give way to the gigantic home being built by Michael Rice, president of Utz Quality Foods? Environmentalists say that without stronger regulations, development could gobble an additional 10 percent of Avalon's remaining high dunes - the last ones in New Jersey - over the next decade. 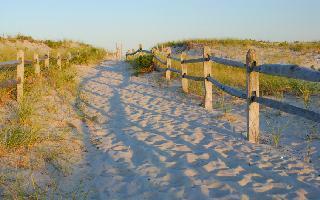 Unlike most coastal dunes, high dunes rise steeply to a height of 30 to 50 feet above sea level. Local officials are so concerned by the citizens' questions that they have hired a public relations firm to answer criticism, said Neil Hensel, chairman of Avalon's planning and zoning boards. "I don't think there is a single person on this island who doesn't understand that these dunes are our lifeline," Hensel said. "But people come here, make a big investment, and want to use that asset. In many ways, our hands are tied by the regulations that we have. "If they don't need a variance to do what they want to do, then we are often in a position where we can't say no." Although large, expensive beach homes are nothing new in Avalon - the $1 million-plus median home price here is among the highest at the Shore - the 40-room dune-top mansion being built by the potato-chip heir is. Rice runs his family's Utz snack company in Hanover, Pa., which was started by his grandparents in 1921. His wife, Jane, is vice president of marketing. The couple also own a 7,000-square-foot house on the beach at 38th Street that has an assessed value of $8.75 million. Six years ago, the Rices paid $3.5 million for a 1.2-acre lot in the 5200 block of Dune Drive. Their first plan was for a 20,000-square-foot home - even bigger than the one they're now building. The Avalon Environmental Commission, which oversees the town's natural resources, rejected that plan, citing the home's size and effect on dunes and wildlife. The Rices appealed the decision to the state Department of Environmental Protection, which regulates some new oceanfront construction. The DEP upheld Avalon's ruling. The Rices then appealed to a state administrative law judge, who strongly advised the DEP to settle with the couple. "It's not often we see an application for a project the size of what the Rices originally proposed building on the site. The scope was unbelievable," said Mark Mauriello, assistant DEP commissioner of land use management. Mauriello said the DEP chose to settle instead of fight because of the costs of the continued litigation and the risk of losing. The DEP couldn't argue, as it usually does in coastal construction litigation, that the house would be unsafe, because the high dunes protect it from the tide line, Mauriello said. The Rices asserted their property rights, arguing that they have a right to build on their land. In 2001, the DEP and the Rices compromised. The couple could build a 14,000-square-foot house on a 9,000-square-foot piece of land. They also would file deed restrictions on the rest of their property that forever prevent further construction. Mauriello said the settlement wasn't "everything we could have hoped for" and involves destroying some dunes on the Rices' property. He said the compromise is "very big" in preserving the rest of the property. Neither the Rices nor their lawyer would comment. In April, the Rices began construction of their three-level house with 40 rooms, 15 bathrooms, and maids' quarters. Mauriello said a landscape mapping project completed by the state in 2002 and new regulations protecting Avalon's high dunes would give the DEP "sharper teeth" in negotiating future residential development along the coastline. Avalon officials say they also plan to vigilantly protect the remaining dunes. "We do have these historic dunes that are unique to Avalon, and my personal feeling is that when you take one shovelful of sand out of them, you are negatively affecting the entire infrastructure," Avalon Borough Councilman Dave Ellenberg said. "We have to do whatever we can to preserve them." AVALON — A newly formed group called Save Avalon's Dunes is planning a rally today to protest a beachfront mansion that will become the island's largest. Construction on the nine-bedroom mansion — complete with maid's quarters — started along Dune Drive several months ago on an upscale block in a town of millionaires. Save Avalon's Dunes member Elaine E. Scattergood said the construction at 5299 Dune Drive cuts through the high dunes and should not have been developed in an environmentally sensitive area. Avalon officials said the building site has all the proper state and environmental permits. Officials, however, did not want the construction to take place and opposed plans as early as 1999. “It is a very difficult problem, one in which the borough has very little control. We've exercised every piece of control we have,” said Neil Hensel, chairman of the borough's Planning and Zoning boards. Schematics of the mansion indicate it will be a sight to see, even by Avalon's standards of luxurious, spacious homes with views of the ocean and bay. Besides bedrooms and bathrooms, it will have an elevator, media room, game room and servants' quarters. Its 15,000 square feet would make it almost one-third larger than Avalon's largest current residence — a 10,576-square-foot structure on the bay in Avalon's northern end, said Jeffrey Hesley, the borough's tax assessor. The land is valued at $7.36 million. And that's without a house on it. With its wooded surroundings east of Dune Drive, the property offers a glimpse of peace and isolation hard to come by in resort towns where sometimes people opt for rocks instead of grass on lawns. According to property records, the owner is Michael W. Rice, the president of Utz Quality Foods Inc. in Hanover, Pa.
Rice could not be reached at his office Thursday afternoon. Brian Reynolds, chairman of Avalon's environmental commission, said the commission held a public hearing in January 1999 relating to the construction there. The commission objected to the size of the project, as well as its effect on the dunes, plants and wildlife, Reynolds said. Reynolds said the state Department of Environmental Protection initially rejected the property owner's plan. The property owner took the matter to court, where it was mediated, and both sides negotiated a settlement, Reynolds said. But Avalon officials said they knew nothing of these negotiations until several years ago. “I think that if people want to change the regulations, then they need to change them in Trenton and not by protesting here,” Reynolds said. Scattergood plastered posters around Avalon advertising a protest to the construction this morning. This protest is meant to be a message. STONE HARBOR — A U.S. Fish and Wildlife Service program will help find grants to help the 21-acre Stone Harbor Bird Sanctuary pump life into the wooded preserve situated amid a sea of concrete. Robert Bartke, chairman of the sanctuary's advisory committee, said he hopes the borough's partnership with the federal Partners for Fish and Wildlife Program will make the sanctuary more hospitable to herons and egrets. With enough money, Bartke said work would include fixing or replacing a pipe that brings tidal water into the marsh. It could also involve removing invasive species and phragmites — where potential bird eaters may lurk — and planting more trees for migrating birds. Bartke said he hopes for a three- to five-year project that will eventually include observation stations for visitors to peer into the sanctuary, which is offlimits to pedestrians. “We want to get the sanctuary to where it was many years ago. Make it so we hope the birds will return,” he said. In September, Stone Harbor Borough Council approved a $50,000 study, one in a long line of speculations and attempted solutions. At the time, borough officials estimated making the sanctuary more hospitable might cost several million dollars. For more than a decade, Stone Harbor officials have tried ways to bring more birds to the sanctuary. Herons and egrets abandoned breeding at the site more than a decade ago. There are a total of 1.3 million birders in New Jersey, 15 percent of whom are nonresidents, said Lillian Armstrong, director of birding and wildlife trails for the state Audubon Society, citing a federal study from 2001. David Mizrahi, vice president of research at the New Jersey Audubon Society, said the issue of herons may likely be a simple one: predators. Raccoons, possums, feral cats. “That's likely what drove the birds out. It's hard to know exactly what a bird sees when it looks at a patch of habit, but from our perspective, I don't think there's anything wrong with the habitat per se,” Mizrahi said. Mizrahi said there are many things that can be done to improve the habitat and make it a nice place for migrating songbirds. They can remove invasive plants and replace them with fruit bearing shrubs, he said. As the barrier islands were built out with development, patches of good habitat diminished. The Stone Harbor Bird Sanctuary remained and is one of the few shows around on the barrier islands. With a habitat the circumference of three-quarters of a mile, the sanctuary stands out. In 1965, it became a registered National Landmark. “When they can find a patch in our world of nearly complete build-out on barrier islands, when they find a patch it can be important, even if it's just a place to rest,” Mizrahi said. AVALON, N.J. -- A 150-ton excavator that got stuck on a beach while working on a seawall project was finally freed Monday after work crews removed parts to lighten it. Just after 5 p.m., a giant construction crane lifted the excavator up and out of the place it sat for more than two months. Onlookers cheered and workmen at the site were seen hugging each other. The excavator, operated by a contractor working on an Army Corps of Engineers beach project, became mired on the seashore along Townsends Inlet on March 28 and was subsequently buried in sand as the seawater from succeeding tides inundated it. For weeks, all that was visible was an exhaust pipe and the arm of the excavator. Previous attempts to remove it have been thwarted, turning the site into a sort of accidental tourist attraction with locals and shore visitors alike lining Ocean Drive to watch the progress of the work _ or lack thereof. "You have to see it to believe it," said Dennis Maguire, 54, of neighboring Sea Isle City, watching from his parked van Monday afternoon. "It's very interesting." The Corps project, to build a seawall protecting the northern end of Avalon from the eroding effects of the ocean, was nearing completion when the excavator got stuck. "It's a mess," said Mike Johnson, 66, of Ocean City, standing on a seawall with his wife to watch. "It's like when you stand in the sand and your feet keep sinking." Residents of Avalon, a tiny summer resort south of Atlantic City, and neighboring Sea Isle City turned excavator-watching into a spectator sport. They showed up with cameras in hand, some bringing small children to watch the work. Many returned day after day. AVALON — Between 2 to 5 a.m., shhhh. Really. Avalon Borough Council this week passed a law that doubles fines for noise violations in the wee hours of the morning. Borough officials said the law is aimed at crowds of people who leave the bars on summer weekends but are loud and unruly. The borough's new law recommends fines of at least $500 and 15 hours of public service for a first offense. Council President Richard Dean said the late-night noise issues only really come into play on summer weekends, after people have left the bars and restaurants but remain noisy throughout the night. “People should have some time when they should get a little sleep. It's just an arbitrary figure as far as time goes,” he said. The borough already has a noise law but hopes increased penalties at certain hours will cause people to hush up. The broadening of the noise law marks the second time this year the borough passed a law aimed at raucous partying. Last month, the governing body passed a law that created a permitting process for special events that took place on borough property or required services of police or public works employees. Specifically, the law was aimed at annual “Floatilla” parties, conglomerations of inner tubes, beer and bathing suits on Avalon's bayside. Last year, a person jumped from the 21st Street bridge and was considered missing as rescuers and divers searched the waters. He was alive and located later in the evening, but Avalon police saw the incident as an indication the event needed to be curbed. The law could end the event, which last year was in its fifth year in Avalon. Ellenberg acknowledged that balance is required in passing laws in resort towns that strive to make sure visitors have a good time so they keep coming back. But the 2 a.m. to 5 a.m. rule seemed a safe bet, he said. STONE HARBOR - When storms barrel up the coast, flood sirens will still wail, but many phones will also ring in a matter of minutes. Thanks to computer automation, for six cents a call, all 3,000-borough residents can be alerted within eight minutes, under a contract approved March 21 by borough council. The voluntary "opt in" program with Global Connect of Mays Landing will be open to all property owners. It will enable those who provide a phone number, which will not be used for any other purpose, to be alerted when Emergency Management Director Roger Stanford declares an emergency. Residents will get further information on the program in an upcoming newsletter, said Administrator Kenneth Hawk. "It utilizes Internet technology. That's how they can do it so cheaply," he explained. "Your privacy is secure," he added. "It will not be used to send political messages. "It's a neat program that will really help a lot of people in low-lying areas," Hawk noted. "It's persistent. If you don't answer, it will leave a message on an answering machine." The resolution states that the cost "is minimal, amount to less than $200 for a notification which would telephone every property in the borough." The contract was awarded without public bid, because, "in aggregate, the total cost of the contract is expected to be less than $1,000," the resolution states. STONE HARBOR — The borough wants to replace and raise the bulkhead — a popular fishing location — near the bayside marina on 81st Street. To do so, it is turning to Cape May County and a new program to fund municipal projects through county tax dollars. Stone Harbor Mayor Suzanne Walters said the borough is applying to the county to fund about half of the $900,000 project. Walters said the bulkhead would be replaced and raised about 2 ½ feet. Walters said a larger bulkhead will help prevent flooding there during severe weather and high tides. It would also act as a table-sized barrier from the bay for people who fish there, she said. “We realized we were going to have to do something. This project came at the perfect time,” Walters said. Cape May County's 16 municipalities are eligible for a combined $3.8 million of surplus funds to towns to help fund public projects. Middle Township, for example, has expressed interest in using county funding to enlarge its bike path. Walters said the marina work involves acquiring the required environmental permits. And Borough Council would also have to vote on spending its share of the money. Councilman Barry Mastrangelo said the marina area becomes a popular summertime spot. “It's used by everyone in the county, as well as local people and the tourists coming to town. A nice day in the summer time, that place will be lined with people fishing,” Mastrangelo said. Earlier this month, Cape May County Freeholders approved the 2006 Municipal Public Improvements Pooled Financing Program. The funding to municipalities will not be awarded until this summer. County officials have said the program allows the county to return some of its surplus without further cutting the tax rate. Officials have said cutting taxes too deep will hurt future budgets because state laws put an incremental cap on the amount a county can raise taxes each year. Also in Stone Harbor: Walters said the repaving of 96th Street may finish in a week, placing work almost a month ahead of schedule due to advantageous weather. Lanes entering and leaving Stone Harbor have been alternately shut down, and downtown traffic detoured from the work. Walters said the rest of the so-called Gateway Project, which includes streetlights and landscaping to the 300 block of 96th Street, is scheduled to finish by Memorial Day. AVALON — The ocean holds many treasures, including the better part of some of Avalon's beaches. Avalon has been stockpiling sand on beaches between 18th and 26th streets. Avalon officials also expect a dredging operation to start within two weeks as part of an effort to restore severely eroded beaches in the borough's northern end. In many places there, beach access is closed. Trucks are moving 60,000 cubic yards of sand from the southern end of the borough and stockpiling it between 18th and 26th streets, where it is needed, said engineer Tom Thornton of the firm Hatch Mott MacDonald. About 2,000 to 2,500 cubic yards are being moved per day, Thornton said. Back passing sand is the first — and smallest — beach replenishment that will take place this month. The dredging will provide about six times more sand than the back passing. “Once they start, it should only take two or three weeks to finish,” Thornton said of the dredging. Joan Hunter, director of the Avalon Chamber of Commerce, said the condition of the beach is of no small concern to business owners. If not remedied, it could discourage vacationers, a prospect not overlooked in a summer economy such as Avalon's. “Everybody in the borough is aware (that) if we don't have beaches, it's going to hurt businesses. It's going to hurt everything,” Hunter said. “The borough was working on (the issue) all along, which we were aware of,” she said. Until last month, borough officials were unsure whether they could find a dredging company to take the project. They had considered back-up plans, including trucking in sand from off the island, if a dredge was unavailable before the summer. Avalon eventually entered into a $2.8 million contract with dredging company Weeks Marine to pump 350,000 cubic yards of sand between Ninth and 18th streets. “I've known for a long time that the availability of dredges was going to get tight because of the Gulf Coast,” said Avalon Public Works Director Harry deButts. Luckily, a dredging company that happened to be working on a project in Brigantine became available, deButts said. “Having the ability to tie into the Weeks dredge coming out of Brigantine was a godsend to us,” he said. As Avalon waited to find out whether they could hire a dredging company, officials formulated back-up plans, which deButts said could have adequately stocked the beaches but is not as efficient and would cost more per cubic yard. While the uncertainty of a dredging project lingered, the Chamber of Commerce fielded questions about the beaches. “I can't tell you how many phone calls we get here asking what's happening with the beach replenishment,” Hunter said. Storms damaged beaches in the fall last year and caused Avalon to cut off beach access at many locations in the northern end. Before Memorial Day last year, a late spring storm also damaged portions of the beach, and sections of the beaches were closed as well. STONE HARBOR — Borough Council will introduce its budget Tuesday with a tax-rate increase of 1 cent per $100 of assessed property value, borough officials said. The increase means a person with a $1 million home will pay $100 more in local purpose taxes than last year. The $10.2 million 2006 budget will be introduced at a council meeting at 4:30 p.m. Tuesday , with public comment and final adoption slated for April. A line-item budget will be available early next week, officials said. 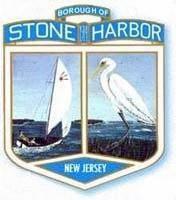 Stone Harbor holds budget presentations before they officially introduce their budgets. Mayor Suzanne Walters said this gives the public advance notice of their taxes. “If there's an outcry, if people didn't like one thing or another, it's better to have it out there,” she said. Among the spending increases this year is more than $80,000 for the volunteer fire department's budget. Last year, Borough Council voted to pay volunteer firefighters stipends as much as $250 per month based on their participation at fire calls, drills, training and meetings. Borough officials said it was done to retain volunteers. The borough also intends to use $819,000 of its $1.8 million surplus. Also in Stone Harbor, Walters said road construction on 96th Street for the Gateway Project is ahead of schedule due to good weather. Borough officials have said they hoped to finish the project by Memorial Day and before summer vacationers arrive. AVALON — The annual summer “Floatilla” party draws rafts, bikinis and beer to the waterways of Avalon. It also drew widespread concern last year, and borough officials have said the event was getting out of hand. In July 2005 — its fifth year — the Floatilla attracted more than 1,000 participants to house parties and inflatable rafts near the 21st Street bridge. The party also attracted the attention of borough officials after a Philadelphia man jumped from the bridge and was never seen resurfacing. Police, rescue divers, lifeguards and K-9s searched for hours believing he may have drowned. He was alive but did not report to police until later that night. The incident prompted Avalon Police Chief Stephen Sykes to say last year that police would map out a plan to deal with the partygoers next time. Last week, Borough Council introduced a law creating a permitting process for special events that not only involves borough property but also those involving Avalon police or public works employees. The Floatilla party, a conglomeration of rubbing inner tubes in Avalon's bayside, would be one of the law's primary targets. It could end the event in Avalon. An application for a special event would need to be filed through the borough clerk's office, and then police, public works and recreation can have their say. Any special event that involves alcohol consumption would need Borough Council approval. The proposed ordinance will be considered for final passage after a public comment session at 7:45 p.m. March 8 in Borough Hall. Avalon Councilman Joseph Tipping said he, a fire policeman, was among others involved in the search for the man. “The Floatilla thing has become so popular with everybody it has become a safety issue. Who would be held responsible if something went wrong? The borough,” Tipping said. Last year, police also issued several citations for noise and open consumption of alcohol. The borough will spend $2.8 million for an emergency beach fill. The borough approved a $2.8 million contract with a dredging company Wednesday night, settling an issue that threatened beaches, tourism and property, Avalon officials said. Avalon negotiated a contract for an emergency beach fill with Weeks Marine Inc. to pump 350,000 cubic yards of sand from Townsends Inlet to beaches between Ninth and 18th streets. “The last thing we can afford to do is not do anything on that beach,” Councilman David Ellenberg said. The borough, which voted to borrow money for the beach fill last year, is paying for the project by itself, unsure of federal funding that is fickle and often threatened with cuts. Storms and encroaching ocean have decimated beaches in Avalon's northern end. Most access paths are closed because the ocean chewed steep cliffs into the dunes late last year. Just reaching north-end beaches is difficult now. “There are public safety issues, as well as economic issues we are addressing to get the beach back in shape by the summer season,” Administra-tor Andrew Bednarek said. Avalon has sought to restock the beaches but had trouble finding a dredging company to do the work—and for about $3 million. After two unsuccessful attempts, the borough entered negotiations. The borough also considered backup plans, which would have included trucking in sand from outside of Avalon, if dredging were not available. However, those options would deliver less sand and cost more per cubic yard. Weeks Marine spokesman Chris Champigny said dredging will likely begin in a few weeks. The company is currently working on a federal beach replenishment project in Brigantine. When Harry deButts, Public Works director for Avalon, looks out on Absecon Inlet in Atlantic County, he can see the answer to many of his problems. Sitting there is a dredger, currently pumping sand onto Brigantine's beaches as part of a $4.5 million U.S. Army Corps of Engineers beach replenishment project. DeButts wants that dredger because his borough is about to start a $3 million beach replenishment project of their own, funded through a city bond ordinance. The quick solution to deButts' problem might be to simply bring the corps into the project with their ability to book dredgers. The solution, however, is part of the problem. The corps already maintains the borough's replenishment project, but in order to move quickly, borough officials decided to bypass the corps and, more importantly, the federal budget process. Although the past several presidential administrations have often cut funds for beach replenishment, the current administration has been more than stingy. When President Bush sends his proposed federal budget to Congress next month, it is unlikely to have one dime set aside for beach replenishment projects anywhere in the country. That will set a host of congressmen in action as they look for money for replenishment projects — both new projects and maintenance of older projects — in other appropriations. And while Congress has often been willing to fund replenishment projects that the president will not, it makes for a long and complicated process. It's a wait Avalon officials decided they couldn't afford because storms have cut deeply into borough beaches since its last replenishment — done by the corps — in 2003. In southern New Jersey, however, there are more than a dozen beach replenishment projects under way. Most of those projects have been engineered by the corps and come with 50-year commitments for maintenance and periodic renourishment of sand. But 50-year commitments aren't very reassuring when funding is up in the air every year. Ventnor, along with Atlantic City, was part of a $25 million beach replenishment project started in 2003. That project is already scheduled for renourishment this year, although McCrosson feels realistically the city won't see any sand until at least 2007 considering the need for new projects along the country's storm-ravaged Gulf Coast. It will be up to local congressmen, such as U.S. Reps. Frank LoBiondo, R-2nd, and James Saxton, R-3rd, to secure funding for state projects. Both congressmen have been successful in securing funds projects in the past. LoBiondo was instrumental to securing funds for the Brigantine and Absecon projects, and Saxton recently secured funding for a $71 million project on Long Beach Island, to cite just a few examples. But for the state's congressional delegation, each year they start from scratch. Making things worse is a lack of a dedicated funding source for replenishment projects. Pallone also noted that setting a guaranteed tax source —such as how the federal gasoline tax funds transportation projects — is a long shot. The federal government, however, is not the only source of funding for replenishment projects. Most replenishments projects are only funded by federal money as much as 65 percent. State and local funds generally cover the remaining 35 percent. That figure is then split, with 75 percent paid by the state Department of Environmental Protection and 25 percent by the local municipality. But state funds can't maintain all of the projects going on in New Jersey or that are committed to 50-year maintenance. Corps officials say maintenance projects are given a higher priority than new projects because the corps tries to live up to their commitments, but at the moment its anyone's guess what will and won't be funded. Except in Avalon, where the borough is paying for everything. Borough officials are preparing a back-up plan to stock eroding beaches before the tourist season after learning that dredging — the most practical option — might not be available. Engineer Tom Thornton, of the firm Hatch Mott MacDonald, said the borough may buy sand from local gravel pits and truck it to the beaches if Avalon cannot find a dredging company willing to take the project. Avalon is seeking approval from the state Department of Environmental Protection for the trucking project, Thornton said. Trucking could produce 180,000 cubic yards of sand between Ninth and 18th streets, the most heavily eroded on Avalon's coastline. Currently, most beach access there is closed because encroaching saltwater chewed steep cliffs in the dunes. Avalon had budgeted about $3 million for an emergency beach fill but could not find a dredging company that would take the job. Next week, Avalon is scheduled to negotiate with two dredging companies and determine whether the companies will take the project and for how much. Avalon has authorized spending almost $390,000 for backpassing — shifting sand from elsewhere in Avalon to the depleted northern end. But the two methods would deliver less sand than dredging and would be more expensive per cubic yard. Together, the two projects could deliver as much as 240,000 cubic yards of sand, about two-thirds of what the dredging would deliver, Thornton said. Either dredging or trucking sand could begin sometime in February, Thornton said. Ellenberg said he hopes the borough can negotiate with a dredging company to take on the project. Avalon is working with a tight timetable, though. The project would likely need to be finished by the end of March due to nesting season for the endangered piping plovers. Updated: Friday, December 16, 2005AVALON-Police Chief Stephen Sykes said enforcing a two-hour parking limit in the business district this summer will be difficult.Sykes, in a memo he sent to Borough Council on Wednesday, outlined potential problems with monitoring vehicles by two-hour limit signs, particularly without parking meters to log the time.Without parking meters, a police officer would have to keep a notepad and record the vehicles in the spots and the time, Sykes wrote in the memo.The borough opens itself to complaints if motorists receiving tickets contend they were not in that spot for two hours, he wrote. Also, a vehicle leaving a spot for a brief time and then returning can also pose problems.Sykes said in the memo he will assign a bicycle officer in the business district to try to enforce the parking regulations. "Myself, representing the Police Department, want to see this work, and I will do everything in my power to see that this happens," he wrote.The borough plans to limit parking times on Dune Drive to free more spots in the business district in the summer.Avalon paid a company to monitor parking availability late this summer. The study indicated that about half the number of cars parked on Dune Drive remained there for two or more hours and sometimes all day.A parking limit, in conjunction with a trolley system Avalon is considering, is designed to put less stress on downtown parking without introducing parking meters.Avalon's neighbors - Sea Isle City and Stone Harbor - both use parking meters.Meters also generate money, but some are concerned that meters will discourage shoppers. "It's going to be a test to see," said Avalon Borough Council President Richard Dean. "We're going to try it, and eventually we may have to go to meters. "Borough Councilman David Ellenberg said the two-hour limit must be enforced to be effective. "I can understand (the police chief's) concern about having a difficult task. But I think the bottom line is if we don't come into this program with the enforcement, then the parking and the trolley issue is not going to be rectified," Ellenberg said.Ellenberg said the borough can reevaluate the parking limit if it is not effective. "One of the reasons we identified this two-hour time frame was we said that's the best way to get this rolling. If that doesn't work, then we'll have to do something else. But I think it will work," Ellenberg said.Parking on Dune Drive becomes a greater concern as Avalon expects several dozen new shops to open in the business district in the following year, Ellenberg said. Updated: Thursday, December 15, 2005AVALON-Borough Council on Wednesday night approved $3 million for replenishing about three-quarters of a mile of beaches hit hard by storms and erosion.Avalon will borrow most of the money for work between Ninth and 18th streets - the northern end of the municipality.The beach fill, planned for completion about February, involves pumping 350,000 cubic yards of sand from Townsends Inlet and depositing it on beaches eroded by the ocean.The project originally called for twice that amount of sand but was scaled down to fit an existing state Department of Environmental Protection permit, which expires Feb. 13, said Tom Thornton of the engineering firm Hatch Mott MacDonald.But the DEP has said it will grant an emergency extension if work continues past then, Thornton said.Avalon officials also said they plan to truck thousands of tons of sand to areas where it is needed most, after the project is finished.An Army Corps of Engineers project replenished Avalon beaches in 2003. However, a recent study estimated that Avalon beaches from Eighth Street to 35th Street lost 1 million cubic yards of sand since then.Beaches have had a tough year.In the spring, northeasters struck near Memorial Day, creating sharp cliffs of sand and forcing Avalon to limit beach access during one of the busiest times of the year.In October, significant erosion damaged many beaches after the remnants of Hurricane Wilma.Borough officials have said they wanted to stock the beaches to protect Avalon from future storms.Also at Wednesday's meeting, the borough said it will hire Hatch Mott MacDonald for $3,200 to design a replacement for the Eighth Street public pier.The borough will replace the bulkhead there and will raise the pier. Avalon anticipates the project will cost $46,000. Updated: Tuesday, December 13, 2005AVALON - Builder Bob Stocki arrived at the shore from Delaware five years ago, just as the boom was taking off. He was immediately busy. He would get much busier. And that's good for him and his work crew.The boom hit in 2000, and it's been going up ever since. It's out of control. I'm building four or five at a time," Stocki said.Business is so good, he doesn't have to advertise. People drive by a job site, see his sign and start offering him jobs. Most of the houses cost about $700,000, and that does not include the price of the lot.Stocki is amazed by how young some of the buyers are. Some are in their early 40s. He built a home for one man who is only 38. They have the money and want Stocki's unique brand of shore home, an older style similar to Nantucket's, with cedar shakes, huge porches, dormers, brick chimneys and no vinyl. Stocki built a $14,000 cypress wood picket fence at one Avalon house. He makes decks out of mahogany and tropical ipe wood. "The theory is if they can afford to buy here, they can afford the maintenance. They don't want to see any vinyl," Stocki said.Stocki, 42, of Ocean City, gives a lot of credit to his architect, Mark Asher, for designing the old shore homes and attracting so much business. "He has 35 start-ups right now," Stocki said. The problem is finding labor. Stocki keeps a work crew of five to eight men busy. The building boom is a windfall for tradesmen. "Labor is very hard to find. Anybody who's worth something is working," Stocki said. It's also a windfall for suppliers of lighting fixtures, decking, bathroom faucets, lumber and many other products. Ron Frame, a Middle Township builder working in Stone Harbor, said his lumber salesman is doing $1 million in business per month.Stocki left Wilmington five years ago to come to a place where he used to vacation. It's no vacation now, just work, and there's plenty of it. Updated: Tuesday, December 13, 2005STONE HARBOR - Ken Lawrence is 57, and after working years as a utility company executive, he wants to enjoy the fruits of his labor.The Bryn Mawr, Pa., resident drives an expensive car and he has a place to vacation on the New Jersey shore. Lawrence describes himself as a baby boomer, and with the birth year of 1947, he's on the edge of a retirement wave expected to boost the shore real estate market. "I'll tell you, we've been working hard our whole lives and it's time to enjoy it. Millions of baby boomers are finally spending all the money they've earned their whole lives," Lawrence said.The retiree owns a house in Avalon and is so bullish on shore real estate, he is building another one in Stone Harbor. He has a place to vacation with wife, Molly, and son Brendan, 15. His older children, Justin, 31, and Melissa, 28, can also have a shore vacation. Like many retirees, Lawrence wanted to invest his money in something solid. He noted that when the national housing market goes down, the values in Stone Harbor and Avalon simply stay flat. "In the last 10 to 15 years, the value has increased about 10 percent a year here. You can't do much better with your money," Lawrence said.He can also make money renting out his houses. Lawrence is not worried that his homes will turn into a bad investment, partly because of the large number of baby boomers yet to retire, and also because they aren't making any more shore real estate. "What's here is here. There's a limited supply. Basic economics tells you when demand outstrips supply, the market will be good," Lawrence said. Updated: Tuesday, December 13, 2005The price of sun, sand and someone watching your back will become a bit more expensive in Stone Harbor and Avalon.The two municipalities are raising seasonal beach-tag prices to compensate for costs of lifeguards, beach maintenance and other expenses.Stone Harbor expects to raise an additional $50,000 from the increase, Borough Administrator Kenneth Hawk said.Preseason and in-season prices will each increase by $2.This year in Stone Harbor, the sale of beach tags raised $529,000, about $13,000 less than last year, said Chief Financial Officer James Nicola. But running the beach cost $560,000. "It's the wages for the lifeguards. It's the cost of running the tractor that rakes the beaches. The cost of gasoline," Hawk said. "We haven't done a change in a few years. We'll make this change, and we probably won't have another change for a few years. "Prices for daily and weekly tags will not increase.Stone Harbor and Avalon sell their own tags. But the tags can be used at both beaches, and both municipalities try to keep the costs the same.Preseason tags, those sold before June 1, will cost $17, Hawk said. After that, tags will cost $22.In Avalon, beach tags recover about three-quarters of the operating costs, Avalon Business Administrator Andrew Bednarek said.This year in Avalon, beach tags brought in $796,000. Bednarek said beach-tag fees were last raised in 2002, when seasonal tags were increased by $3.Avalon expects the new increased fees to raise an additional $75,000, Bednarek said.Normal expenses, coupled with a planned $3 million beach-fill project in Avalon next year, make the sand business an expensive one.Stone Harbor Borough Councilman Barry Mastrangelo, who serves on the borough's Beach and Recreation Committee, said the borough would not increase beach-tag costs more than necessary. "It's really not a profit center. You're looking to offset the expenses of maintaining the beaches," he said.